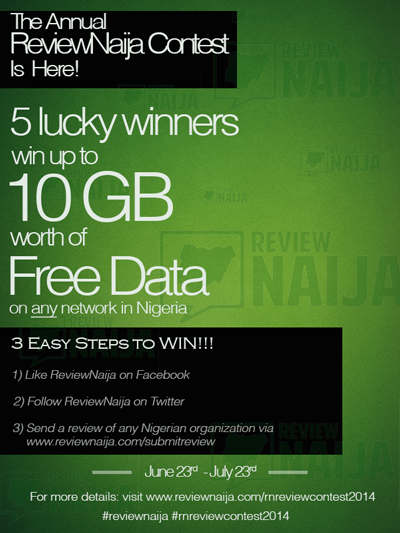 Berry Dakara: Win Free Data of up to 10GB in the 2nd Annual ReviewNaija Contest!!! Nigeria's premiere online company review website, ReviewNaija (RN), is back with their annual giveaway. The rules are simple. Like their page on Facebook, follow them on Twitter, and send in a review of any Nigerian organization of your choice. Ten reviews would be chosen by the RN team, and then readers would get to pick the top 5 reviews via an online voting system. The author(s) of the 5 reviews with the highest votes win data ranging from 2-10GB on ANY network in Nigeria! Prizes for the top 5 winners! For more information, visit our ReviewNaija 2014 Contest page here! Also, check out last year's winning review here, and view pictures of our 2013 contest winner here!